A deluxe desk combined with a custom-made credenza is the perfect complement to any office. Deluxe desks and credenzas are usually made of solid oak, cherry, walnut, maple and mahogany wood. These office furniture items will keep all your reference materials neatly on hand, while impressing clients in your executive office. You can even use your credenza as the perfect standing workstation. Your credenza can include dual center filing drawers, an optional slide-out printer and fax tray drawer and matching filing cabinets. What’s not to love about the office deluxe desk with a credenza? Have the workspace you need and want today with Mark Downs Furniture’s Deluxe Desk and Credenza. 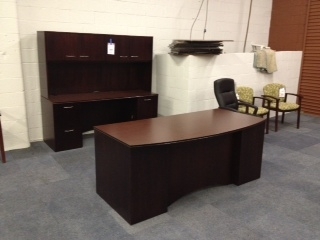 We have used deluxe desk and credenza furniture at a price you can afford. This entry was posted on Thursday, September 6th, 2012 at 4:45 pm. Both comments and pings are currently closed.